The difficulty in not being able to fit into and adjust to the school environment. Why I was constantly bullied and teased within secondary school. Seeing things and taking comments from other people very literally. Unemployment issues and not being able to find employment. 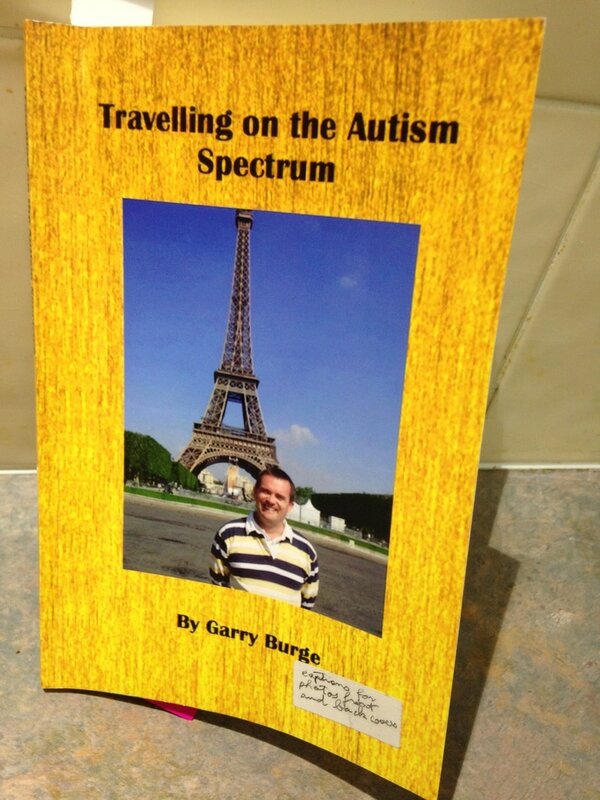 "Travelling on the Autism Spectrum". This book documents my travels as an adult on the Autism Spectrum and I hope will be useful to travel companies, travel providers and persons with Autism. Just like my first book below, this book took me approximately under 1 week to write. Information on how to obtain the book is below. The book is approximately 110 pages. It is hoped that book will inspire other adults on the Autism Spectrum to travel so that they too can travel and experience a greater sense of adventure in their lives. 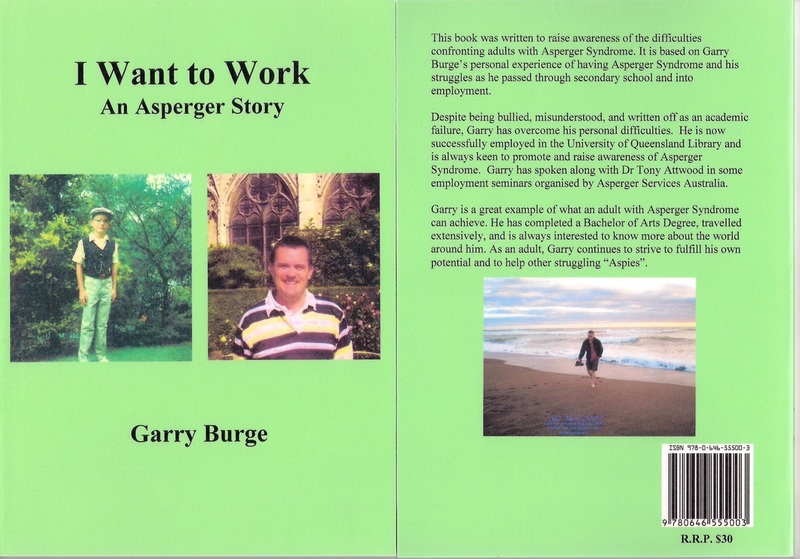 This book outlines the challenges and difficulties I confronted in finding employment and also suggests strategies to employ adults on the Autism Spectrum. This book contains an ISBN 978-0-646-55500-3 and Barcode which makes it easy to catalogue and add to any library collection. It also is useful for adults on the Autism Spectrum looking for employment. This book is also within the National Library of Australia collection. How does Asperger Syndrome affect me? I find it hard to read body language, identify social cues and I often find myself socially isolated from others around me. More importantly I rely on a lot of mental energy to try and converse with people and this is very draining causing me to want space and some isolation from people around me. I also find large groups difficult as I often find it difficult to follow group conversations and furthermore I find group work and activities very difficult. The most difficult thing I find is also trying to develop a lighter side as I am often serious and take things very literally. I cannot always understand the point of small talk and more importantly why people are not always up front with what they say and mean. It is also difficult to make friends and I find navigating the social world very difficult and often overwhelming. Asperger Syndrome affects everyone differently but for me I just find I constantly struggle in some areas of my life in a day to day struggle. I am fortunate to have held down employment but for the many other adults who are unable to hold down a job, their lives are often spent in silence, social isolation and low self esteem. Hopefully this website will help in raising awareness and providing support where possible. People with Asperger Syndrome including myself may also be very upfront in what we say and feel and often we can offend regular people without knowing it. Society just needs to understand Asperger Syndrome more as people with Asperger Syndrome do not want the world to be all our way but instead for a two way understanding so that people with Asperger Syndrome can be understood by regular people so that we can all exist in the world together. AMy life has been difficult, challenging and interesting. I was born in Albany Creek on the northern outskirts of Brisbane in 1972 in what was then a rural location. I always knew I was different from other children but I could never put my finger on exactly why I was so different to other children but I just had to fit in the best way possible. I always seemed to have fallen through the cracks within the school system. I was never good academically and nor was I good at playing sport. I was unusual in that I kept to myself when I was younger and found it difficult to make friends and to be understood within the school system. I struggled through the 12 years of schooling the only way possible, and in 1991, I left secondary school altogether which was for me a big relief. Compared to both primary and secondary school, I found secondary school much worse for bullying and teachers not understanding me. I was seen as having no brains nor even a future and was written off as an academic failure. I also scored perhaps one of the lowest TE (Tertiary Entrance Scores) in the state of Queensland, and I was glad to see the TE Score system be abolished in 1991. In all honesty I do not think the OP Score is much better for I did not like seeing myself as being a numerical failure. 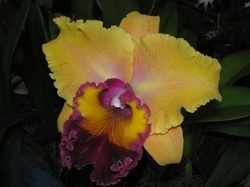 The reason why an orchid is featured on this page is that I grow orchids and still do. I found growing orchids an escape from the world around me and a means of therapy. At one stage I had 200 orchids in my collection. Despite my wilderness years, my life has been interesting. I managed to obtain a Bachelor of Arts Degree majoring in Politics and Sociology in 1999 from the University of New England. Much earlier in my life in 1992, I was also successful in obtaining an Office and Administration Course from Lorraine Martin College. It was at this college that I learned to touch type and basic bookkeeping. I was also fortunate after repeated and numerous attempts to find employment, having worked in the University of Queensland Library as a Service Support Assistant. I would like to thank the University of Queensland Library for providing me the opportunity to be able to travel, and to do obtain other things in my life which would not have been otherwise possible. I would encourage anyone reading my website to not lose hope and think obtaining employment is impossible. It is possible and my own experiences reveal this. Please also visit Dr Tony Attwood's website within the links page on this website to find out more about Asperger Syndrome and also hear Dr Attwood speak on Autism Hangout and Dr Tony Attwood Interview. In April 2019 I resigned from the University of Queensland Library due to needing to care for my elderly parents and personal reasons. In April 2019 I also accepted an appointment as a Casual Guest Speaker within the Univeristy of Queensland Department of Psychology. I have been approved of NDIS (National Disability Insurance Scheme) and awaiting this plan to be further approved. With NDIS funding I sought NDIS funding with A Place To Belong It is through this organisation that I am looking for support in terms of a Life Coach and Support Person to assist me in my goals. As a graduate of the University of New England I also submitted and expression of interest for the UNE Council as a graduate. I am still awaiting the outcome of this decision? I have many interests apart from Asperger Syndrome advocacy. I have always been interested in history. I studied both Ancient and Modern History. A lot can be learned from both areas of history. I was fortunate to have visited Rome, Italy in 2010 and to walk through the Roman Forum and to see the Colosseum and some other notable landmarks. I am also interested in literature and travel. My other interests include photography and writing. When I was younger I had an interest in radios both shortwave and medium wave. At one stage I was even considering obtaining a Amateur Radio Licence so that I could be a Ham Radio Operator. My other interests include Genealogy and I have managed to research back to the 1600's. I have ancestry connections to both the United States and to Ireland as well as the United Kingdom. I am also interested in nature and animals. I believe strongly in the importance in protecting wilderness areas around us. I think animals also have an important place in our world. I like to keep an open mind to learning more about the world around me. I also study the Bible in my spare time and try to do my best to be a good Christian as well as help with a model train set at Sinnamon Village. Support is required for adults on the Autism Spectrum. The medical fraternity also needs to understand where to assist with early intervention and in providing necessary services. Support is also required to increase services. Donald's story. Donald Gray was the first person ever diagnosed with Autism. Read his story Autism's First Child. On Wednesday 8th June 2011, I had the very fortunate experience of visiting Autism Works in Newcastle in the United Kingdom. I got to observe at first hand the pioneering efforts of both Peter MacDonald and Chris Mitchell. More information about Autism Works can be found by visiting the links page of this website. Upon visiting Autism Works I saw their office and their drive and enthusiasm to get adults on the Autism Spectrum into employment. Chris Mitchell showed me some of the basic duties and the company's bid for funding. I also caught up with Peter who gave me a tour around Newcastle and shouted (Australian term for buying someone a meal or drink) me lunch. I also expressed my willingness and support to assist Autism Works in Australia should they wish to expand here. 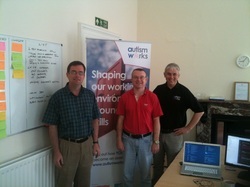 Please check out Autism Works up to date website.